Update: The formatting issue is caused by a bug with reledmac (see comments). Would it be possible to achieve the same output with an alternative setup? Very happy to receive suggestions. I am having some formatting issues with numbered lists while using the enumitem and reledmac packages. I have placed nested lists within a ledgroup using reledmac as I want the footnotes (two types) to appear at the end of each section instead of the bottom of the page. (The lists and numbering are as they should.) 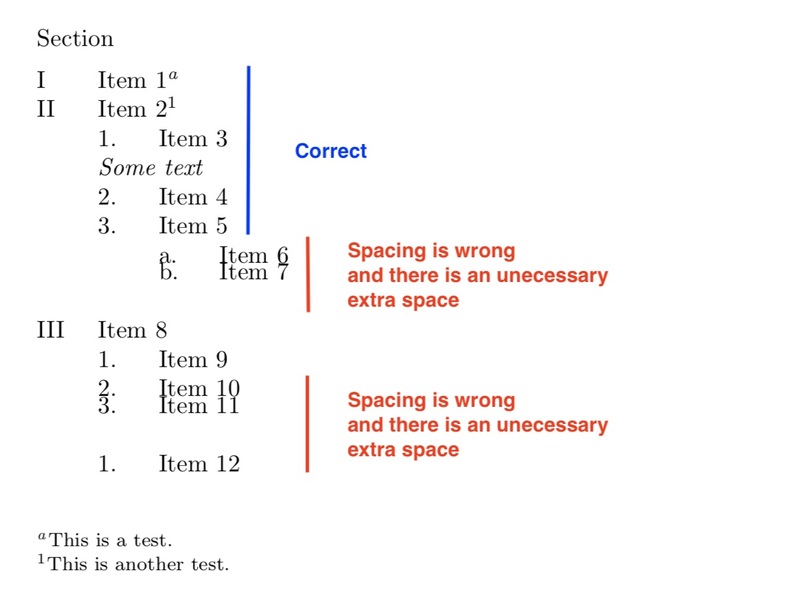 As shown in the example, spacing between some but not all items is not as it should. Is there any way to resolve this? Many thanks. Browse other questions tagged lists enumitem reledmac or ask your own question.